Beth Fish Reads: What's a Challenge or Two among Friends? What's a Challenge or Two among Friends? Really and truly, this is the last of my 2010 challenges. I'm in a ton, but they overlap so much, I'm confident I'll manage to finish most, if not all of the ones I've signed up for. If I fail, I think I'll be able to hold my own against the Challenge Police. I hear they're pretty forgiving. Elizabeth from As Usual, I Need More Bookshelves hosts the great 451 Friday feature that asks bloggers what book they would become. She has created a challenge based on those books. I'm in at the Spark level (1 or 2 books). The master list of books is awesome, and every week there is something new. To sign up visit the 451 Challenge blog. Ever since I won a Sony eReader from NetGalley and Sony at Book Expo of America last May, I've been hooked on the device. It's such a great space saver, easy on the eyes, good for the environment. Anyway, I digress. This is the first time I've been able to join this challenge, hosted this year by Royal Reviews. I'm in at the Fascinated level (6 books). To learn more and to sign up visit the E-Book Reading Challenge post. Here's a total no-brainer. When J. Kaye decided not to host her audiobook challenge, I was bummed, but yay to Royal Reviews for taking charge. You know I have to join this. I mean, I love audiobooks! I'm in this one at the Obsessed level (20 books). I bet I'm done by mid-year. 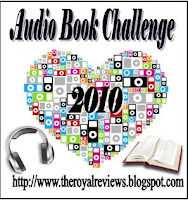 For more information and to sign up, head on over to Audio Book Reading Challenge post. When Alea and Laza forced encouraged me to sign up for the graphic novel challenge for 2009, I was worried. I had never read a GN before and suddenly I was committing to reading 12! I read 18 graphic books last year and can't wait to read more. For more on the Graphic Novels Challenge, visit the blog (note: you can also read GN nonfiction). I'm in for the Expert level. Once again Amy of My Friend Amy, is challenging us to buy books. Oh what a hardship this challenge is. I'm in for 12 books. This year I finished the challenge by March. I wonder how quickly I'll finish in 2010. 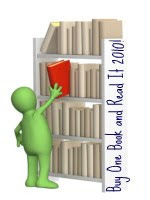 Think about signing up for the Buy One Book and Read It challenge for 2010. Seriously, you can sign up at the 1 book level. Here is the challenge I may be most excited about. Thanks to Amy of My Friend Amy, I've become a huge Beth Kephart fan. Her Nothing but Ghosts will be in my best of 2009 list, and I can't wait to read her other books. I would have read Beth's work with or without the challenge, but I'm in the Beth Kephart Reading Challenge 2010 at the Mix'n'Match level, which is to read 4 books. I hope to read more. Please, please, please think about joining this one. You won an eReader? Wow! I've been wanting one since I saw the new cool-er eReaders. I think I'm going to buy one before Christmas - buying one online is, like, 30 euros cheaper than buying it at the mall here, can you believe it? The 451 challenge has been calling me - the book list is too awesome - even though I thought I'd stay clear of reading challenges for a while. The Beth Kephart challenge, too, especially for the YA books! I only read Undercover so far. Pity it's a bit difficult for me to find her books here, unless I buy them. How many challenges does that make for you? Good luck! I think you might be tempted by a few more challenges before the end of the year :-) They are so addictive! You are so lucky to have won a ereader. I hope I win one soon! I am cutting back this year on everything...including reading challenges. Have fun with your eReader. I totally agree. It is a space saver. I have a Sony, but want a Kindle. I keep holding off thinking there will be a better on just around the corner...lol. Have fun with your 2010 Reading Challenges. This coming year is going to be so much fun. I am going to join the Beth Kephart Challenge and will check out the 451 as well. I need to draw the line_____________(yeah right). Yeah, if there was ever a no-brainer for you and I, it would be the audio challenge. I'll probably have mine done in the first quarter! I'm also doing the e-book challenge, cause I love my Kindle. I'm a GN virgin, but I decided this was the year to expand my horizons. It's all good really. Nobody is going to hunt us down and shoot us if we fail! Great challenges. I'm seriously contemplating the 451 challenge. It is really calling my name. Some times I just can't resist temptation. 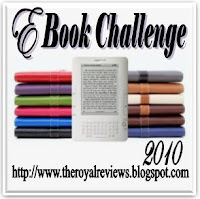 I'm also doing the e-book challenge. Wow! You're awesome. I still need to write up a few posts -- especially Amy's Beth Kephart one! Good luck and enjoy all of the challenges you've signed up for, Beth! Oh, Beth. I am so honored by this challenge. And so deeply respectful of all you true readers out there. I keep saying "I'm done with challenges" but then another sneaks in there. But now I'm really done. 10 is enough!!! But being forced to buy books. .. hmmmmmmm. All of these challenges are so tempting (except the e-reader one since I don't own one). I'm trying hard to control myself this next year but when you talk of crossovers and buying new books - well, why not? Thanks for pointing me to the audio book challenge Beth - just signed up for the obsessed level. What fun.